Every English school-kid knows Nottinghamshire’s Sherwood Forest was home to Robin Hood and his band of outlaws. Yet despite what the movies say, the outlaws were probably all men. Maid Marian was actually invented by the Victorians. In the 13th century, Sherwood was a royal hunting forest and a magnet for deer poachers. Within the forest is a massive tree, the Major Oak. Over 800-years-old, it measures 33 feet in diameter. A fence protects it today, but until a few years ago, kids emulated Robin and his "Merry Men" by hiding inside its hollow trunk. Back in the 1960s, I was one of them. Some scholars dispute Robin Hood’s existence, saying he sprang from memories of the Green Man, a forest god from England’s pre-Christian past. Whatever the truth, every folk-tale agrees how Robin died. He was bled to death by his aunt, the Abbess of Kirklees Priory in Yorkshire. With his last breath, he blew a hunting horn, calling Little John to his aid. But the faithful lieutenant — a giant of a man — arrived too late. If Robin existed, nobody knows his burial place, as Kirklees Priory was destroyed in the Reformation. 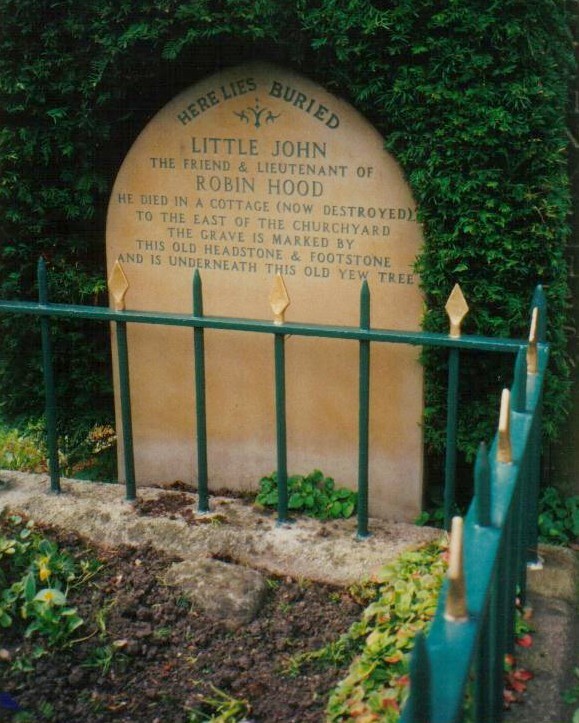 However, visit Hathersage village high on the moors above Derbyshire’s Hope Valley and you’ll be able to pay your respects to Little John. If the stories are correct, Little John met a more dignified end than Robin. He died of old age in the 13th century in a cottage beside Hathersage’s church. Although the cottage has since been lost to time and the elements, it was still in use as late as 1847. Its last occupant was a 70-year-old woman called Jenny Shard who heard plenty of Little John-Robin Hood stories from her father. When Jenny was a girl, she told folklorists that the grave was opened and a 32-inch thigh bone discovered. This indicates a man around seven feet tall. 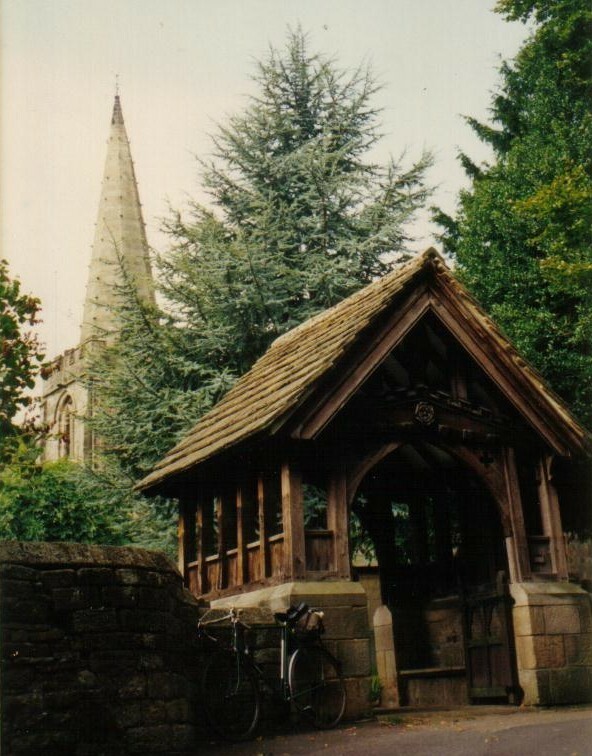 Other historic records state that up until the 17th century, Little John’s cap and long-bow were kept inside Hathersage church. Before leaving Hathersage, I drank a toast to England’s best-loved robbers. The ideal place to sample a pint of England’s infamous warm ale is in the village inn. 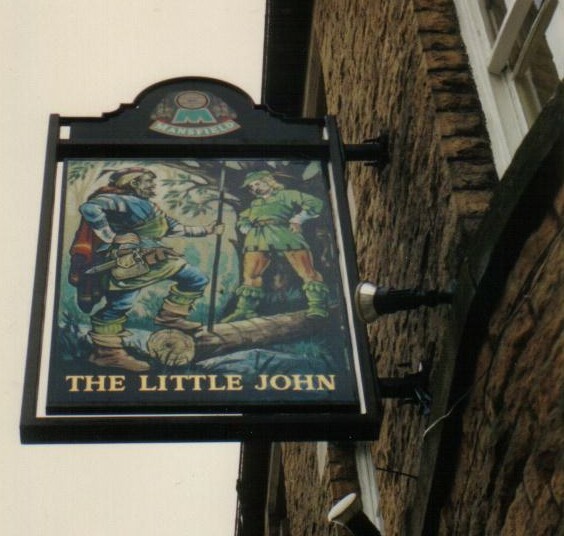 Its old-fashioned wooden tavern sign depicts a green-clad giant — and, as you’d expect, it’s called The Little John Inn.